These are lyrics by Soundgarden that we think are kind of repetitive. (Black hole sun, black hole sun) Won't you come? It turns out Chris Cornell doesn't even know what this means. Black Hole Sun won't ya come? No offense, great band...but won't ya come, won't ya come, won't ya come, won't ya come, won't ya come on and shut the hell up! Soundgarden's, "Blow Up The Outside World"
Out in the sunshine, sun is mine. Who would be so conceded as to brag about owning the sun? Why, Chris Cornell of course. That guy needs to quit losing his head! 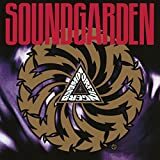 Soundgarden's, "Fell On Black Days"
Keep it off my wave. Keep it off my wave. Chris Cornell was feelin' so outshined he had to notify the 100,000 people who outshined him. Yeah, Chris, so what the bloody hell is your point? Are you so outshined that you can't think of a better chorus than this? So what do they got you hanging from?